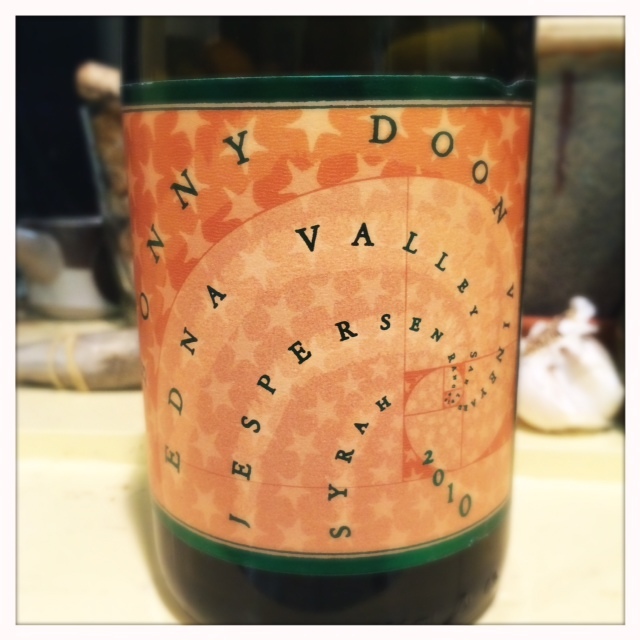 I picked up the Jespersen Syrah after a recent trip to Bonny Doon with my wife Emily. I had one a few months back and hadn’t exactly been overwhelmed by it but it tasted spectacular in the tasting room so I thought I’d give it another chance. I’m glad I did. The Jespersen Syrah is Randall’s most cool-climate Syrah. Like many of his Syrahs on first opening there’s a lot of primary fruit. This one also had a pleasant funk on the nose but I’ve learned that Bonny Doon Syrahs need some time to breathe in order to develop their secondary cool-climate Syrah characteristics. After some time open, this wine has those flavors in spades, aromas of salty licorice and tobacco with some fresh strawberry or raspberry aromas in the background. Those fresh fruit aromas carry over onto the mid-palate with nice acidity and lift, the tannins are reminiscent of a St. Joseph wine because they aren’t overwhelming or harsh. Great stuff. The wine comes in at a cool 12.7% alcohol level. 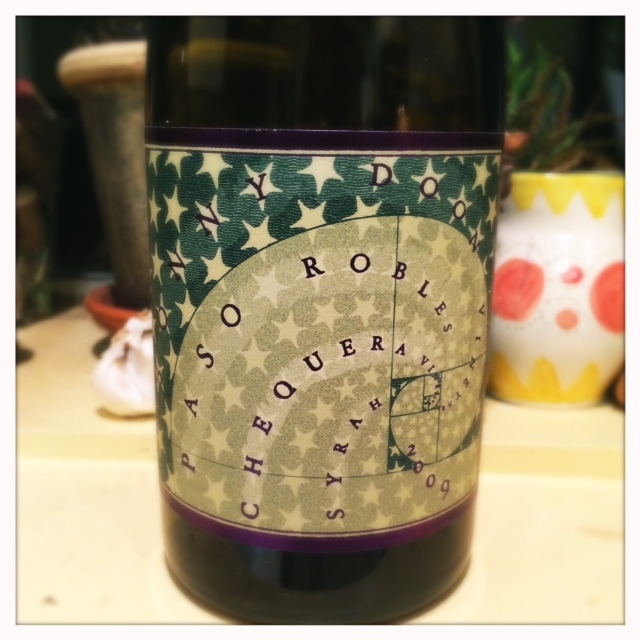 The Chequera is not as elegant a wine, in fact it’s kind of a tannic beast at this point. There’s a lot of pomegranate and blackberry on the nose, also some earthiness and a lot of minerality. It’s a big wine but somewhat restrained because of its relatively low alcohol level (13.7%). It’s hard to believe that this wine is from Paso because of its fresh fruit flavors but wow it’s tannic. I can only imagine what the Syrah was like without the addition of the Viognier which may have tempered the tannins a bit. It’s a drying wine that’s reminiscent of some of the Petaluma gap wines I’ve had. Sort of an in-between warm and cool-climate Syrah with its huge mid-palate on present tannins. I like it but it’s a wine that begs for bold food. This is not a Syrah that you could enjoy with chicken. It’s a Syrah that kind of fits the stereotype of big and meaty dishes like barbecued ribs. I enjoy it but it’s not as much “up my alley” as the Jespersen. Randall Graham continues to impress me with these single vineyard Syrahs. Just take my advice and open them at least an hour before drinking or, even better, let them breathe overnight. 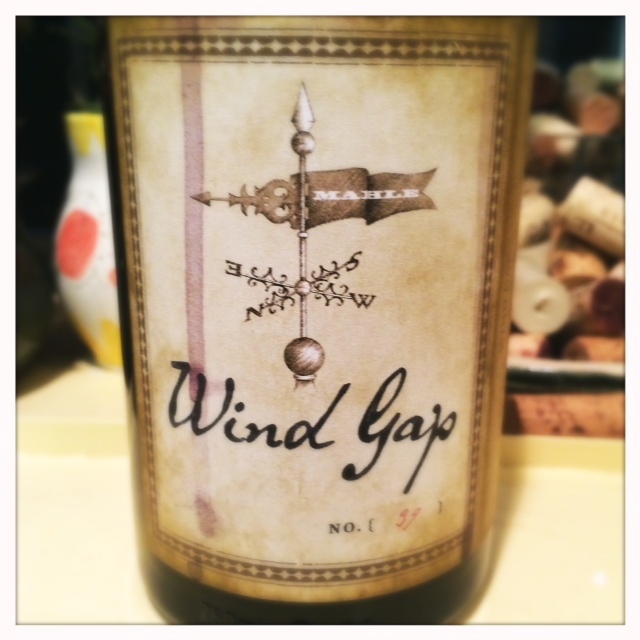 This 2011 Wind Gap is now in the running for my favorite cool-climate California Syrah. It has beautiful, elegant fruit aromas of plum and raspberry but there’s so much savory going on also. It’s a wine with undertones of tobacco, black pepper, and black olive tapenade but it’s also so fun to drink. It’s the perfect combination of complexity and ease. The mid palate is just so fresh and there’s not much tannin on the finish, a very flexible and food friendly Syrah. For those of you who don’t know much about Wind Gap, there’s a lot to tell, most of it has been told over and over again on the internets and much of it is related to the story of the collapse of Pax Wine Cellars and the subsequent birth of Donelan Family Wines and Wind Gap. If you are looking for more information on these subjects, check out a recent Levi Dalton podcast in which Pax Mahle puts a lot of questions to rest. A recent Wine Searcher article also fans the flames of controversy a bit and is a good read (even if it may not be the complete story). The most significant news lately, in my opinion, is that Pax is re-launching Pax Wine Cellars and thus opening a new chapter in what promises to be a venue for more Syrah. The lower alcohol wines of the Wind Gap portfolio will stay where they are but Pax will move some of his fuller-bodied Syrahs back over to his eponymous label in what seems to be an attempt to corner both sides of the Syrah (warmer versus cooler) dichotomy. I’ll probably be mostly sticking with the Wind Gap label but I’ll be intrigued by some of the forthcoming Pax wines such as the Griffin’s Lair and, of course, his Alder Springs—which only has Syrah because Mahle convinced the grower to plant some many years ago. I don’t think the alcohol levels will be huge with these wines but they will be fuller, bigger styles of Syrah (as they always have been) and the resurrection of the label will give Pax a chance to express that bigger style in a way that he has perhaps not felt comfortable doing under the Wind Gap label. I remain more interested in the Wind Gap versions of Syrah because of their ease of drinking and their complex aromatics. They are also more versatile on the table than the bigger Syrahs that beg for steak or barbecue and this 2011 is no exception. Definitely one of the better Syrahs that I have tried so far this year. 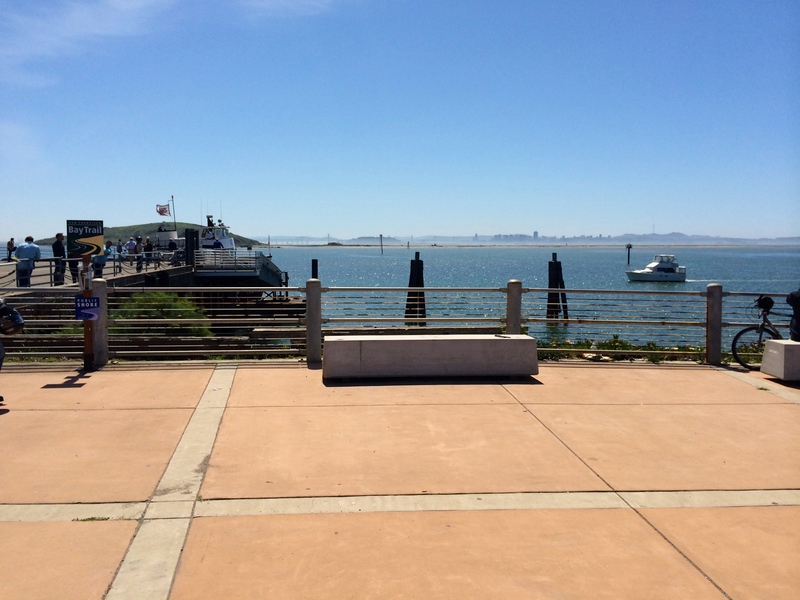 Umm, yes, I’d like to taste some wine with this view. The annual Bay Area Rhone Rangers tasting is a great way for me to get a sense of the state of Syrah in California. Although it’s usually missing some of my favorite Syrah producers like Peay, Arnot-Roberts, and Failla it still has a growing cadre of cool-climate Syrah aficionados that make it a great place to check in on Syrah. This year’s tasting was my favorite so far. 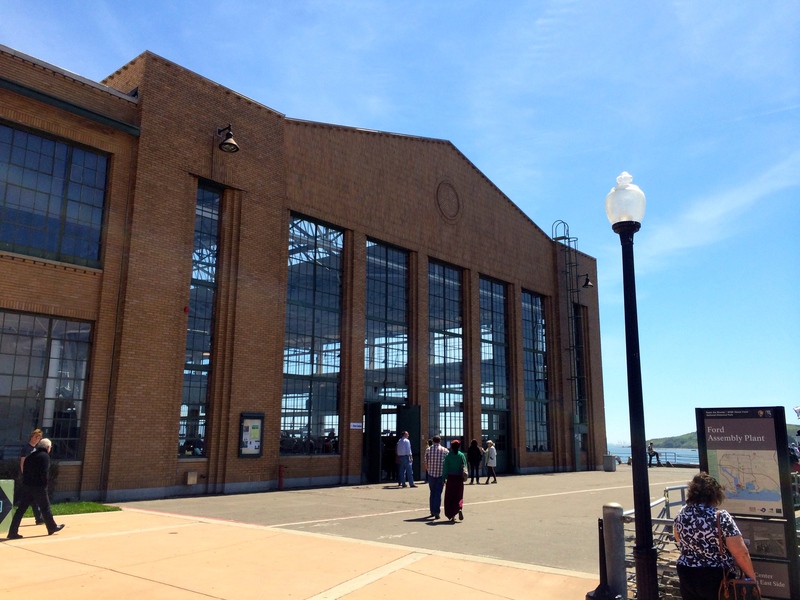 The location at the Craneway Pavilion in Richmond was beautiful and the wineries were spread out well to allow for a lot of elbow room and a lot of face-to-face contact with winemakers. The crowd wasn’t too big (great for those of us there, but maybe not for the wineries) and although there were a few noticeably inebriated people there seemed to be less general drunkenness than in previous years. It’s nice to have a plan when going into big events like this and for me the plan was to taste a lot of Syrah. I checked in with the handful of producers that are doing Syrah in the style I appreciate but was also keen to find some new producers doing a cooler-climate style. Here’s a list and brief description of wines that I tasted at this year’s Rhone Rangers that most represent the lower alcohol, cooler climate style that I love some much. The wines below are organized by the order in which I tasted them. I’ve written about this wine before but Kieran Robinson’s 2010 Bennett Valley Vivio Syrah is a great example of elegant Syrah. The wine has mid-palate lift and some great olive and red fruit aromas. The 2009 was a bigger wine from the same vineyard with more of a meaty chocolate profile. The ’11 just got bottled and will come in at about 13.3% ABV and the 2012 at 14.3% ABV. Kieran says that this type of vintage variation is common in Bennett Valley; you pick it when it’s ripe. Terre Rouge in an old Syrah house that wasn’t on my radar until last year’s Rhone Rangers event. Bill Easton makes spectacular Syrahs from special spots in the Sierra Foothills and Lodi. His lower end wines tend to see less oak and are made for easier drinking with an emphasis on fruit and lower tannins. His higher end Syrahs are more tannic and see a lot more new oak and are meant to age. The 2010 Les Cotes de l’Quest was actually my favorite from the tasting because of that judicious use of oak and had a bright and pure fruit profile. The 2008 DTR Ranch is their estate wine and sees a little more new oak. The oak was mostly in check and the Syrah flavors came through nicely. The 2008 Sentinel Oak was a much “bigger” wine with more tannins on the finish and more new oak. It’s still got great acidity though and I’m sure this is the kind of Syrah that could age for a long time (and already has) but for me I just would have liked to see the oak dialed back a tad. The 2008 Ascent is that vintage’s example of their flagship wine. This wine spends 24 months in new oak. It had more of a blue fruit profile. I think this is a good wine for this style but again I think the new oak could be dialed back. Although there’s no question in my mind that these are well-made Syrahs, my question is why not let the the pure fruit aromas come through more on the higher end wines keeping the new oak in check? I love checking in on William’s wines and this was one of the few wineries where I tasted through all the wines. The whites were tasting beautifully and William’s curent release of reds seemed even more cohesive at this juncture then the last time I tasted them. William does have a yet-to-be-released 2012 Saralee’s Vineyard Syrah that he let me taste off to the side. I really like this Syrah (especially after the Terre Rouge wines) because it only sees neutral oak so it’s a great example of how a completely unadulterated Syrah picked at low alcohol levels can bring forth the true character of the varietal. This wine is young and had just been opened so it was full of mouth-filling acidity but also really delicious fresh fruit character. It’s an elegant Syrah that sets itself apart because of its core of acidity. I can’t wait to taste it in about 6 months to see how it continues to evolve in bottle. Going from William’s Syrah with it’s bracing acidity to Ryan Sherman’s easy-drinking Lodi Syrah was a study in contrast. I won’t go on too much about them here because I’ve only recently done a blog post on them but I do want to say again I am struck by how Ryan achieves fresh fruit character in his wines in Lodi. Yes they are riper styles of Syrah but these are not big vanilla and blue fruit Syrahs. His judicious use of oak, well-timed picking decisions and the cooler site along the Mokelumne River Valley allow the wines to maintain a true Syrah character. 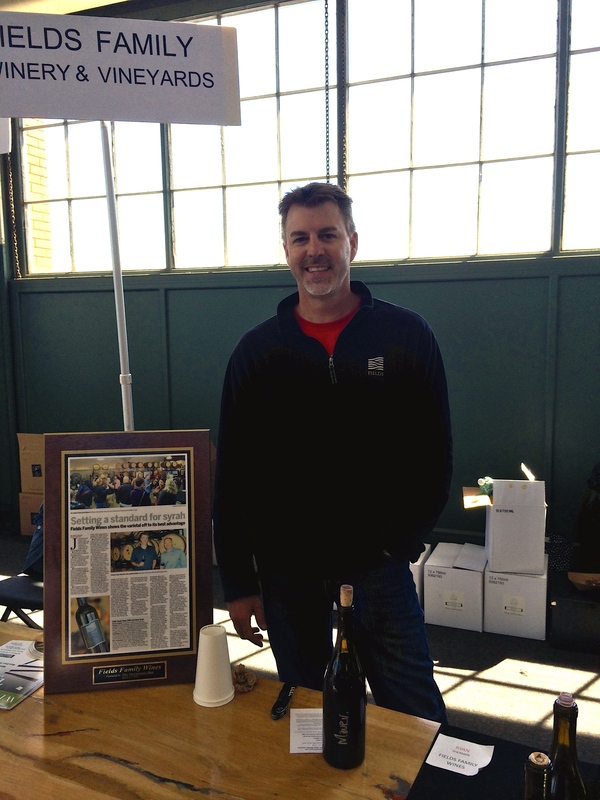 I hadn’t checked in with Donelan since Tyler Thomas had moved on (link) and it was nice to meet new winemaker Joe Nielsen. Most of the Donelan wines aren’t exactly cool-climate but I was struck by their judicious use of new oak and a nice core of acidity that carried through all the Syrahs. The 2011 Cuvee Christine is Donelan’s blend from different vineyards and is meant to illustrate the potential for Syrah in Sonoma County. It’s a nice fresh style of Syrah. Not too complex and intensely food friendly. The 2011 Walker Hill, which I’d had before, was also well done with nice fresh fruit elements and surprising acidity. The 2011 Richards (which was being poured at small samples off to the side) also showed enjoyable Syrah savory aromas and freshness even after spending 30 months in barrel. It was a pleasure to spend some time with Gideon Beinstock at Clos Saron. He’s the type of person I think I could sit and talk to for hours and someday I hope to get a chance to do just that at his winery in the Sierra Foothills. If you want to learn a lot more about the Clos Saron project then you’ve got to check out this excellent podcast with Levi Dalton. All of Gideon’s Syrahs were great but I did get a common thread in the aroma profile that was both perplexing and alluring. The closest I can come to describing it is that it was almost like the aroma of a root beer candy, maybe mixed with a tootsie roll. I asked Gideon if he got any common thread of aroma through all the Syrah and although he didn’t say yes he did say that it was possible. Gideon mentioned that it could be the native yeast from the winery and then he laughed and told me that possibly it was just his own stinky feet. (Gideon makes the wine in an old world style and still foot stomps the grapes.) Regardless of how that interesting aroma got in there it’s clear it’s become part of the “terroir” of the Syrah. The 2011 Stone Soup Syrah and 2009 Heart of Stone both had great cool-climate profile with savory aromas and a nice acidic core. The 2005 Heat of Stone was a bit more extracted and a riper style which Gideon attributed to an over exuberance on his part at this time of his winemaking career to extract big fruit and flavor from the grapes. He now works the grapes less (less punchdowns, less maceration) to make his wines more elegant and less “new world” in profile. I also checked in with Steve Law to get a chance to taste one of my favorite Syrahs, the 2010 Judge Family Bennett Valley Syrah. I think Steve did a great job with this wine and I’m always impressed with it’s freshness and aromas of salted plum and olive. It’s always a treat to taste. Now these were the wines of the tasting for me. As I mentioned before, this year’s event was less overwhelming than the previous years and I was thrilled to see that there was some space at the Qupe table for me to actually talk with Bob Lindquist and fawn over his Syrahs. I’d recently had a corked Qupe and one that was hopelessly infected with Brettanomyces so I was thrilled to get a chance to wash away those bad experiences with what I was hoping was some great Syrah. I started off with the 2011 Bien Nacido Vineyard and boy was it tasting good. Elegant, floral, peppery and bright with a well-structured mid palate this was a delicious example of a classic site for Syrah. The next wine was an iteration of Qupe’s famed Sawyer Lindquist Vineyard. The 2011 Sawyer Lindquist “Sonnies” is an homage to Bob Lindquist’s mother and is a selection of the best blocks from the vineyard and the best barrels from those blocks. This wine was tasting spectacular. It had that perfect combination of cool-climate characteristics mixed with rich and delicious mid-palate and an elegant finish. The 2011 X Block Bien Nacido was also floral and elegant and tasting very much in balance at this moment. 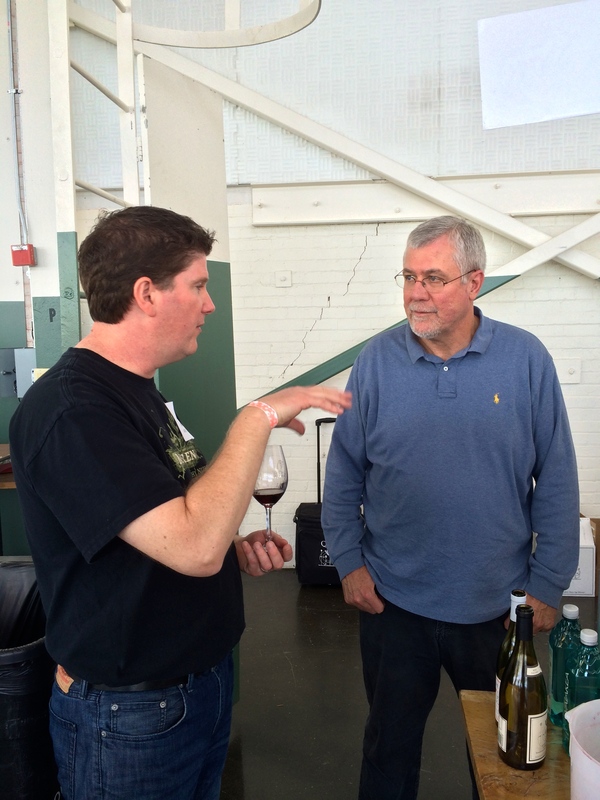 It was a happy moment for me to taste these wines and get to talk with Bob Lindquist to extoll the virtues of cool climate Syrah. At one point Steve Law came over from MacLaren and the three of us geeked out on French Syrah and how food-friendly it is. I love to check in with Stephen and Carole’s deliciously graceful Napa Syrah. This is a full wine but it’s light on it’s feet at the same time. The 2011 had a classic cool-climate Syrah black olive disposition with a full mid-palate. Again, this is a Syrah that shows that judicious use of oak and smart picking decisions can create an elegant Syrah in an area known for bigger wines. I finished the day checking in with a relatively newer winery because I noticed that they had a Rodger’s Creek Syrah which is a cool-climate site near the Petaluma Gap and Carneros. The 2009 Rodgers Creek was a beautiful Syrah, peppery and bright with beautiful elegance. Another winery to get to know more and a style that I hope they stick with. All in all, I’d say that there are more wineries attempting to make Syrah in a more floral, peppery, savory style; less blocky and big and overly brawny. Few wineries have gone all in on that style and some of my favorite Syrahs from the cooler vintages of 2010 and 2011 have climbed up in ripeness and alcohol level for 2012 and 2013 when the vintages were warmer so it’s hard to say if there’s really a stylistic shift or not. I’m heartened by many of my talks with winemakers who agree with me that Syrah doesn’t need to be jammy and oaky but then they admit that in order to please the general consumer they generally offer Syrahs that are bigger and riper to round out their portfolios. And maybe this is indeed the future of Syrah, that we just have to get comfortable with the fact that it comes in different styles and that consumers appreciate both styles. As long as the cooler-climate styles stick around then I’m comfortable with that.